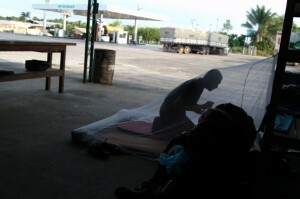 Right after we got into Roraima, the first district close to Venezuela, we sighed. We finally got rid of all the ´be safe`, ´it´s dangerous` and all similar warnings. And even though closer to Rio de Janeiro ´Vaya con Dios` will become much more of a frequent blessing, but in the North we somewhat wanted vacations from all the warnings. And true, the first night we finally camped in the area which looked neglected but didn’t belong to anyone. Finally our tent fitted much better to the scenery of mountains in comparison with the gas station´s lights. So we are safe, aren’t we? In the morning, when we already got on the road, the army vehicle stops us. `What are you doing here?´ ´We were camping on that hill` we showed. Well, I know it, he showed binoculars. And that unpleasant feeling that he might have seen everything even the part of a outside toilet matters. Why on earth people like to be part of reality shows? ´I know you have camped here, but it´s dangerous here´. Jeez, here comes again. We didn’t want to hear any of that anymore. ´The Indians might be pretty aggressive here, its their territory´. 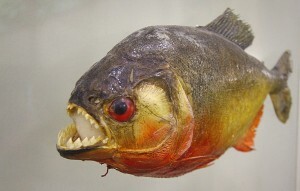 He just tries to scare us off. Well, apparently later we got to know that in the local areas its not advisable to stop, as the indigenous people can be pretty territorial, and there are cases that they were violent with obtrusive tourists. One driver, who was going through Waimiri Atroari area was very much in tension, and told he is not going to stop for couple hours at all as bad things might happened. We saw kids on the road dressed in a western style, but couldn’t tell much more about whether its truth or not. Well, they are local they know more, especially that indigenous here have their own laws and the police wouldn’t be able to help in the case of violence – you risk at your own risk. To Boa Vista those couple hundreds kilometers we got pretty fast. 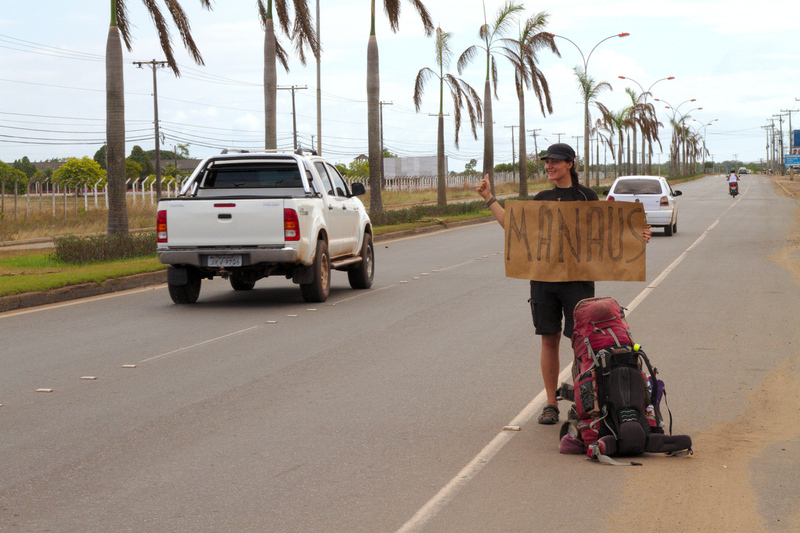 But the thousand km to Manaus it felt like we are going to get stuck in some village for ages without getting any step forward. Its hot and dusty, and despite the fact that the drivers are all smiling and show ´duckling mouth`with their hands, we are not getting any further. The final option that we were happy with was going slowly from one little village to another. But that’s a great experience after all as we are getting a chance to feel the ambience of the local life – kids playing football as they would be professionals, someone taking to cook a turtle for their dinner. Our tent suits pretty well in the football field close to all the others simple houses. The next morning one smily kid brings a basket of fruits. We just couldn’t help but give him a hug – he was kind of hope in our slow progress. That day we got into Manaus. 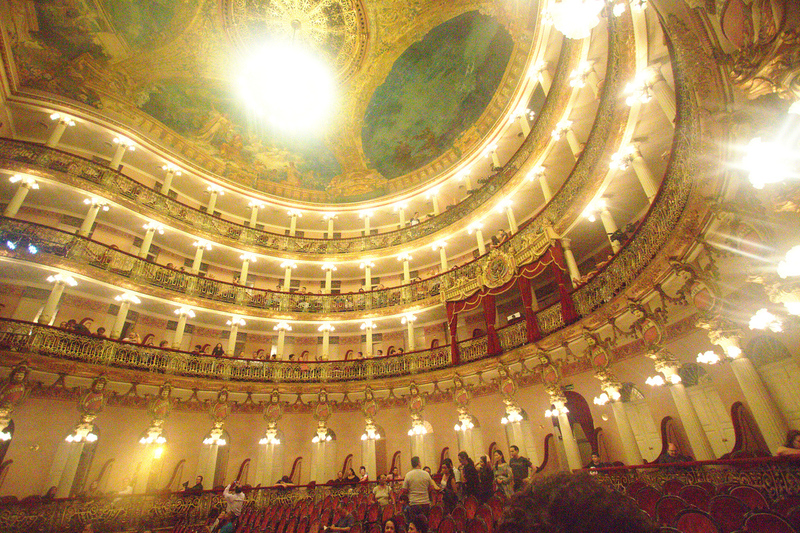 Manaus, the city in the middle of the jungle would sound like a very romantic place. Maybe it was with its glorious rubber tree business past, and you can witness it with some buildings which are ok copies resembling old town somewhere in Europe. But otherwise the down town streets are dirty and damp, the homeless people found their places close to the port. We got a chance to visit Marcelo, our couchsurfing host, who works at INPA (research institute of Amazon). He has got a dream job with his office in the leafy park (a wonderful oasis in the middle of chaotic city). It is open to visitors too, and this is one really worth place to visit. 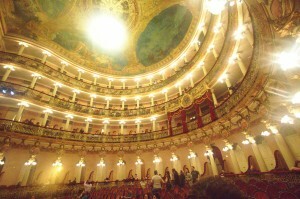 Teatro Amazonas is pretty impressive too, and we were delighted to hear Mahler symphony in it. For free. Brazil can be really great offering all those cultural opportunities for free. Marcelo also invited us to his friends party, and the Brazilian music that we heard that afternoon really made our spines go chilly. In a very positive way. Their voices – and they are not professionals at all – made us shiver. Then the songs at church later in the evening – how can you not fall in love with Brazilian music. 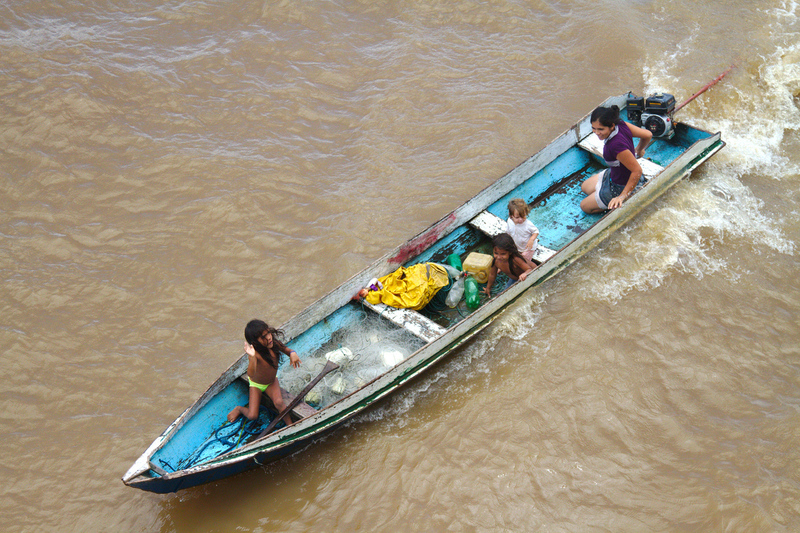 Upon our arrival we hear news – there is no more road down south, so we ought to take a boat from Manaus to Belem. To be honest, we were pretty happy with that. Something we cannot avoid, and to be quite pleasant too. So the next week we will be following the stream of Amazon, seems the most voluminous river in the entire world. When you enter the ship – and Anne Katherine II proved to be a cozy one – the first floor was already filled with local people hanging in their hammocks. The second floor was slightly more spacious. So we bought the hammocks and hung them there – that´s going to be our seats, rooms, eating and meditating places for the following two days. 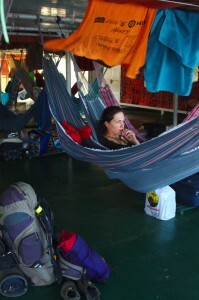 Hammocks are like art here – some are plain and budget one, but some are with some knitting or some fancy patterns done, some of them are even family ones – so you can see a mother with a child or a couple swinging in them. Those who are complaining about little action on this road are perhaps those are scared to meet themselves whilst their letting their thoughts flow down the river. Besides, there are always interesting life situations to be observed performed by the local – from those, who are simply meditative in their journey up to those who in the evening dress their smartest attire and sprays their perfume, and goes for some serious action which never seems to be exciting. But the life is there – just catch and observe it. And the river is impressive after all. And not only because you can see some pink dolphins making salto over the waters. 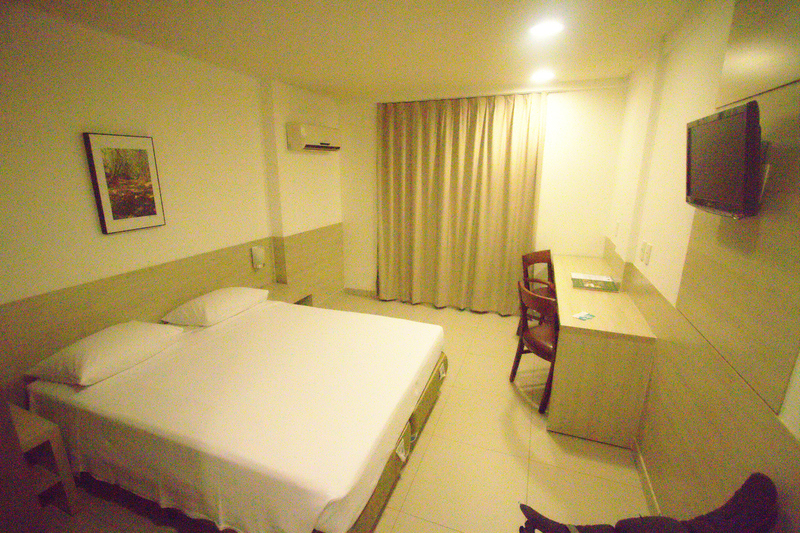 The rainforest might be slightly far away – the river is really wide, but closer to Belem it looks much cozier – the banks of the river are very close. It’s a rainy season, so the ode to the rain should be told on its own. It comes with a huge force, and the dark horizon turns into a total gray matter covering everything. You feel you are going to disappear yourself. There are some interesting happenings on the way too. From Santarem to Belem (which is another piece of Amazon oddissey) you can observe tons of small boats approaching the big ship waiting for something to be dropped. 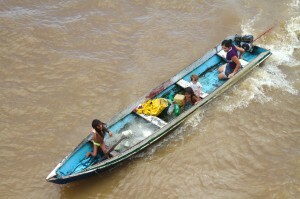 Some boats are with a motor, some with kids all smiling and waiving like Queen Elizabeth. And someone from the ship actually dropping some sort of plastic bags with something in it. SO some are luckier as the others, but the sharing system is unclear. It doesn’t matter its raining or not, the small boats waiting for something to get to them. It seems that the civilized world attracting them loads. Amazon´s problems cannot be talked enough about. The problem is not only for Brazil, but for the entire planet. We don’t think we will be able to look at soya products with the same look anymore. Deforestation is a massive problem here. The native forest people are moved and squeezed into the little houses outside the city with the promise they are going to watch tv all day long. But the issue much more grand than that – they don’t have their usual way of life. But how they agree to leave their homeland? They lived there for ages, but never had any documents. So the smarter ones – the greedy farmers – come threatening to expel them as they have legal documents and the native don’t. So there is only option and that is – to be moved out in peace. You ask whether there is any evidence of the harm? If the drought in the rainforest is not a problem, then what? Not only plants are affected, and the climate, but the people with floating houses too, when they get stuck for long times without the opportunity to move forward. Alter do Chau is a beach town close to Santarem it is indeed a perfect stop. The islands are of white sand, and the views are breathtaking too. SO why to rush to Belem so fast, if you can enjoy that pleasure a bit longer. We have experienced good people all around the world. Some countries seem to be more hospitable than others. Brazil goes on the top list. Particularly that part from Belem down to Brazilia. One young rich farmer Bruno offered us a good hotel so we can have a good rest as he said. We looked a bit like natives who haven’t seen the civilization and not knowing how to behave with a porter who was ready to help us with umbrella or with a trolly bringing our stuff to our room. And then the superdriver Josiel, who not only gave us a lift for 1400 km but also made sure we will get a hitch to Brasilia too. He cooked us dinner on his truck stove. In fact being with him, we experienced the massive storm too, which tossed our just cooked steak on the floor. Sitting in the swinging truck cozily didn’t want to imagine us standing outside in that rain. 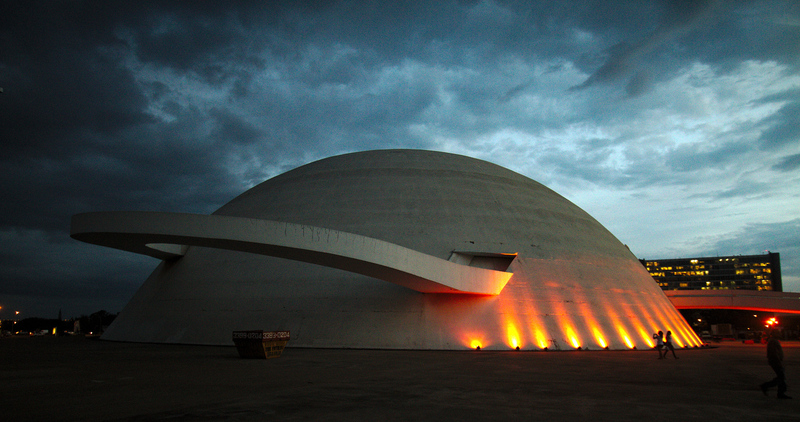 The capital of Brazil is a piece of art. Or can we call it that way? One way or another it has been planned by one architect who had high ambitions. It was planned neatly and from above looks like an airplane. In front at the cockpit there is governing part – parliament and senate, president palace and all the ministries, the industry at the tail, and the residential areas at the wings. Thanks goodness that Brazil doesn´t have enemies, otherwise it would have been too easy target for any attacks. Otherwise, there are no skyscrapers, and all the architecture reminds a bit of socialist buildings. The church is super modern with its glass dome above, and some buildings like theatre, the museum or even the parliament with senate looks a bit futuristic knowing the fact that they were designed in seventies. The entire city seems to function in some sort of artificial way. But there is a feeling that you need a bit of chaos in all that. Otherwise its all too perfect. 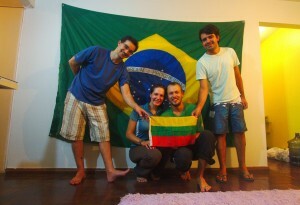 Thanks to couchsurf hosts Joao and Tiago in Brasilia, it all made sense here. And Rio seems to be a perfect opposite to Brazilia. The endless homelessness, favelas and slight chaos all around makes you feel you are alive. Maybe a bit too much. The Christ Redeemer statue seems to be blessing this all containing city. The urban beaches are definitely not our travel destination but the mountainous sight with sugarloaf mountain and Corcovado mountain seem pretty spectacular giving an image of impressive city which used to be capital in the past. But maybe it’s a good chaotic intro into what is awaiting of us in the next continent?